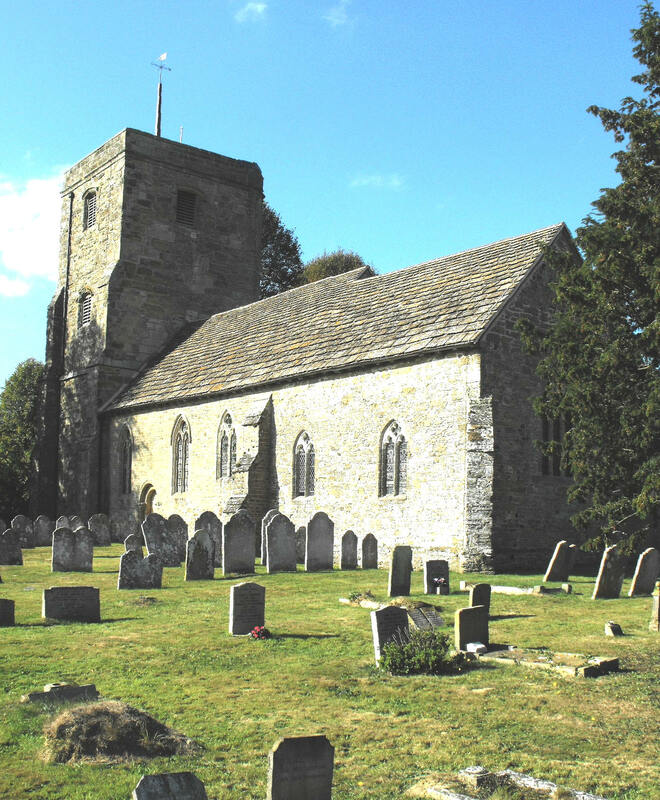 This is a massively constructed, heavily buttressed church of medium size (shown left, from the southeast), constructed of sandstone believed to have come from neighbouring Fittleworth (church guide) and, except where repaired, roofed with Horsham slates from the Weald clay division of the Lower Cretaceous Series. It consists of a W. tower, nave and chancel, with an independently-gabled N. aisle and chapel, and a lean-to sacristy immediately beyond, adjoining the sanctuary. The original nave and chancel were apparently Norman, as shown by the surviving blocked S. doorway (below right), formed of two orders, with a quarter roll around the outer order and pair of shafts with cushions capitals supporting the inner order. Most of the church’s more important work, however, is now Early English, including the basic fabric of the N. aisle and chapel walls, each pierced by a N. lancet, and the three-bay N. arcade inside the building (illustrated below left, looking northeast from the aisle), formed of double-flat-chamfered arches springing from circular piers with moulded capitals. The chamfers are fairly narrow and the form of the arcade in general suggests the early thirteenth century. The two-light W. window to the aisle, with plate tracery, has probably been renewed, while the three-light E. window with reticulated tracery (below right), dates from the early fourteenth century (after the introduction of the ogee, c. 1320, and categorically not in the thirteenth century, as listed in the church guide). 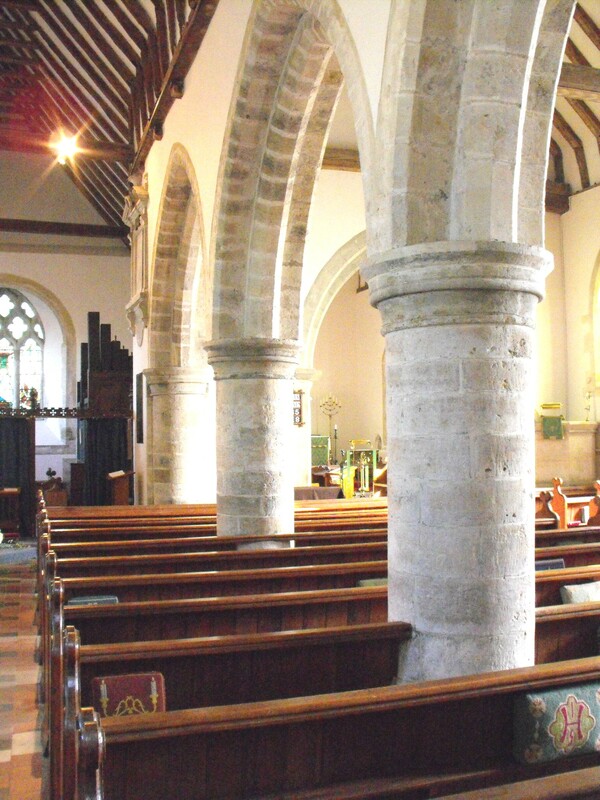 The chancel arch is Victorian but its rather crude form (composed of two orders bearing narrow flat chamfers, with semicircular responds below) suggests it copies thirteenth century work either by a different mason or of a different date to the aisle. There is a squint to the north of this arch, but the larger opening to the south appears once to have been something else. 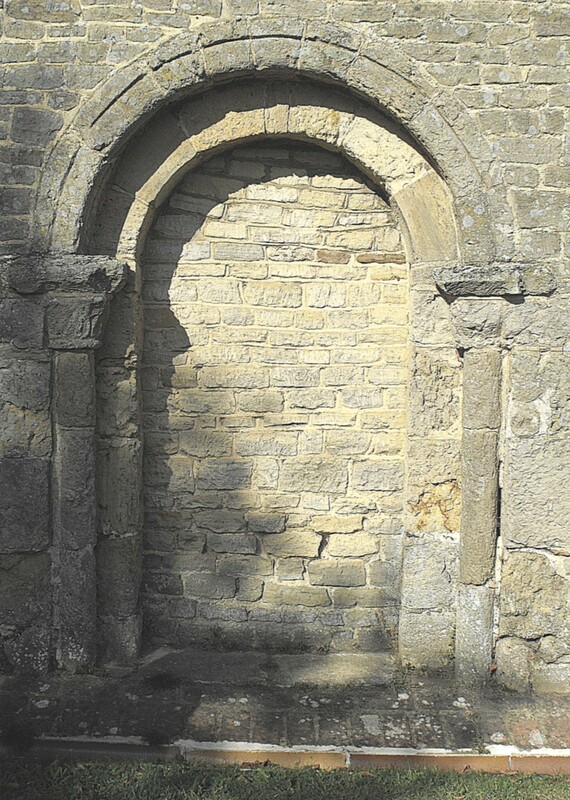 The tower arch carrying three flat chamfers which continue down the jambs without intervening capitals, would also fit a thirteenth century date, although as the Perpendicular tower itself gives no other hint of replacing an earlier structure, perhaps this arch is actually contemporary and merely constructed in what, at that time, would have been a distinctly primitive style. Externally the tower gives a curious impression, for the segmental bell-openings and similar-sized windows immediately below, have lost all their tracery, and this, together with the plain parapet above and the massive semi-octagonal stair turret projecting at the northeast angle, rising to the same height as the tower, give the tower an almost late eighteenth century appearance, although the W. window in the lower stage retains its supermullioned tracery, The tower rises in two tall stages, supported by angle buttresses, and there are more buttresses at intervals around the rest of the building, including one to the north, at the junction between the nave and chapel. The chapel communicates with the chancel through a single arch also carrying two flat chamfers, the inner of which is supported on corbels, and the chapel ends in line with the altar rails, leaving room to the east for an odd lean-to, Perpendicular sacristy. Both this and the tower could be fifteenth century in date. The two S. windows in the chancel with straightened reticulation units above trefoil-cusped lights, are probably late fourteenth century work. (See Appendix 2 for some close-dated examples of this tracery shape, albeit that they are all to be found in eastern counties north of the Thames.) 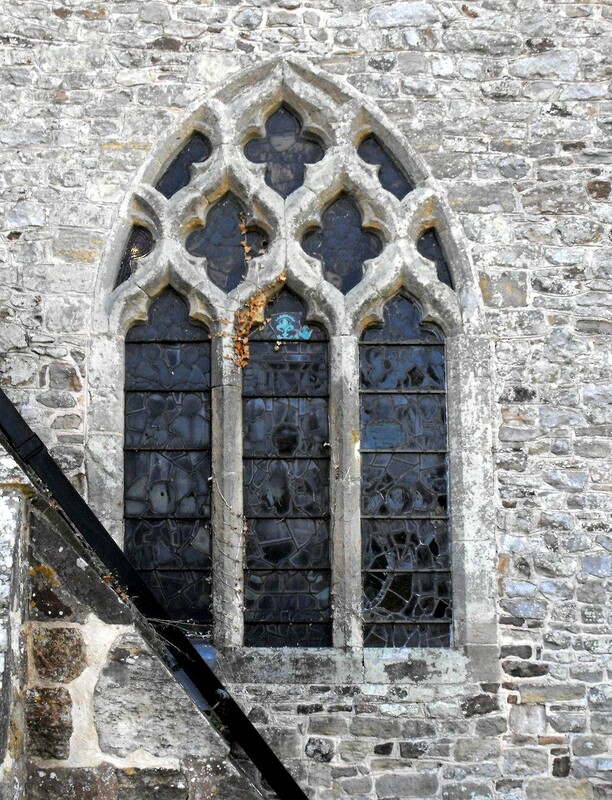 Other windows in the church include one with the appearance of c. 1300 in the eastern end of the nave S. wall, with two trefoil-cusped lights and a quatrefoil in a circle above, a three-light supermullioned window in the chancel E. wall, a two-light supermullioned window in the chapel N. wall, and an ugly Perpendicular one with alternate tracery without subreticulation in the N. wall of the aisle. Nearly all these windows have wide splays internally. 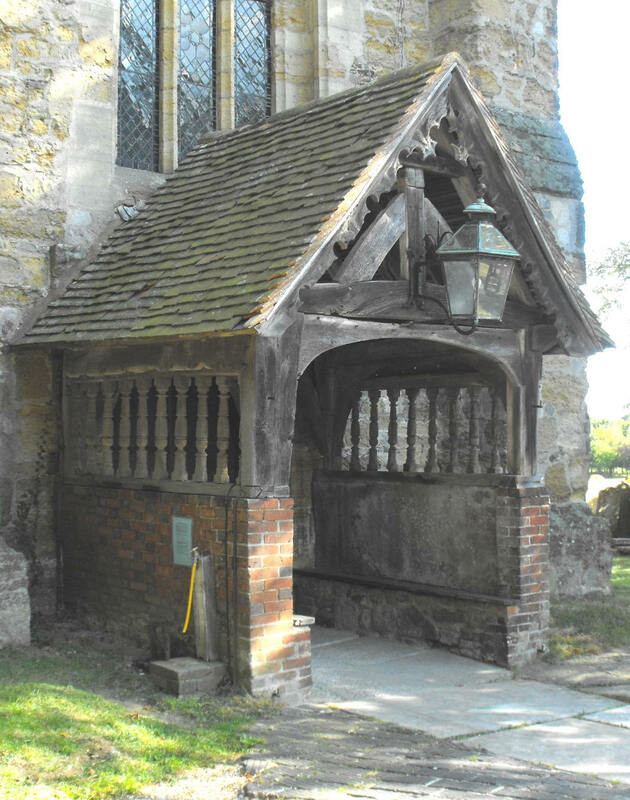 Finally, one other part of the building that requires mention is the porch built against the tower W. doorway (shown left), which is half-timbered above a stone base. The openings at the sides are supported on turned balusters and the outer doorway is four-centred and very depressed, suggesting a Tudor date. Old woodwork inside the building is confined to the roofs and altar rails. The roofs are all of collar form, braced in the chancel only but all with the addition of a few tie beams, some of which appear to have been replaced. 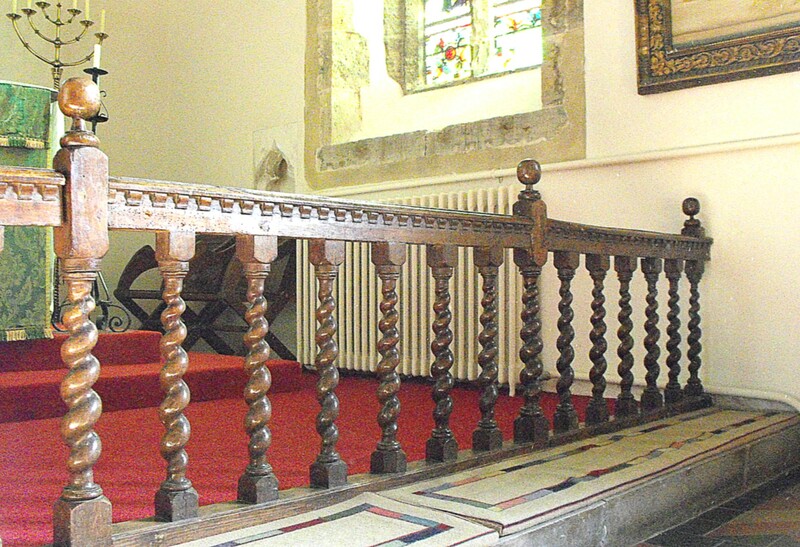 The altar rail (below) has barley sugar balusters supporting a rail with ball finials on top. Both the church guide and The Buildings of England, perhaps the one quoting the other, ascribe this to the late seventeenth century. The shallow square font appears to be Victorian at first glance but is inscribed “H. S. 1620 R. P.”, the initials being those of the church wardens at that date (i.e. 1620).